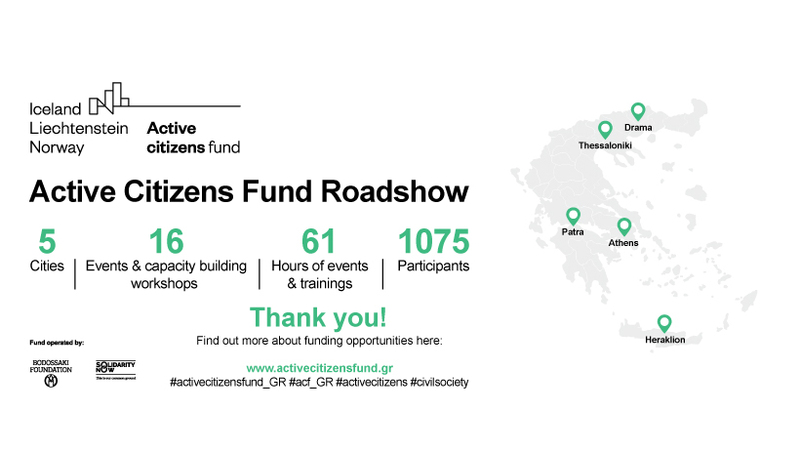 With the participation of 1075 representatives of civil society organizations, representatives of local authorities and local entities, the ‘roadshow’ for the presentation of the Active Citizens Fund in Greece has now been completed. The roadshow began with the programme launch event in Athens on 21 February 2019 and finished off in Heraklion, Crete, on 21 March 2019. Events were also held in Thessaloniki, Drama and Patra. Altogether, 16 events were implemented, totaling over 60 hours of information and training. Information events in the 5 different cities presented the overall aims and key characteristics of the ACF, while a series of 11 capacity building workshops provided over 350 CSO representatives with training on how to plan and write successful applications for the programme. Similar workshops will be repeated in different cities at a later stage in the programme. The training materials have been video recorded and are available to download from the programme website. The Active Citizens Fund in Greece is supported through a €12m grant from Iceland, Liechtenstein and Norway as part of the EEA Grants 2014 – 2021. The programme aims to develop the sustainability and capacity of the civil society sector in Greece, and to strengthen its role in promoting and safeguarding democratic procedures, active citizenship and human rights. The Fund Operator for the Active Citizens Fund in Greece is Bodossaki Foundation in consortium with SolidarityNow. The call for Bilateral Cooperation Initiatives is also open. The call is intended to support activities aiming at enhancing relations between Greek NGOs and entities in the Donor States (Iceland, Liechtenstein and Norway). The total amount for funding under this call is €92,000.